"If you’ve upgraded to Yahoo! Messenger 10 or got a new webcam recently, chances are you’ll want to try out the high-quality voice and video call features. As a first step, we recommend that you complete the “Voice and Video Setup” steps to ensure that your microphone, speakers/headphones, and webcam are working properly. To get started, click on the Messenger menu and select “Preferences”. 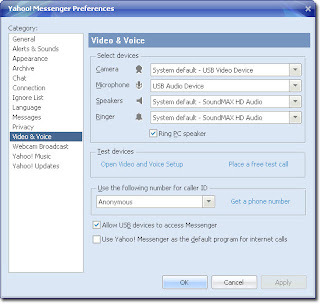 When the Preferences window opens, click “Video & Voice” on the left hand menu. This will bring up your options on the right hand side:"